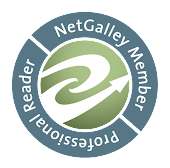 I am sure that it is not going to surprise anyone that I took part in another of Lisa of Grateful Artist's blog hops. When she first mentioned Jasper, I perked up. She sent me a wonderful kit consisting some of gorgeous red and dark brown jasper (not sure just what variety it is), sea glass and some brass findings which of course I forgot to take pictures of. I had loads of fun with this kit though. I started off with a necklace first of all. I just loved the beautiful colors and patterns in the jasper but none of the beads were really big enough for what I had in mind. I had picked up the focal which is tiger iron a few months ago which really played well with the jasper so I set to making a beaded chain with the jasper, onyx and brass. The clasp is the one Lisa sent along. 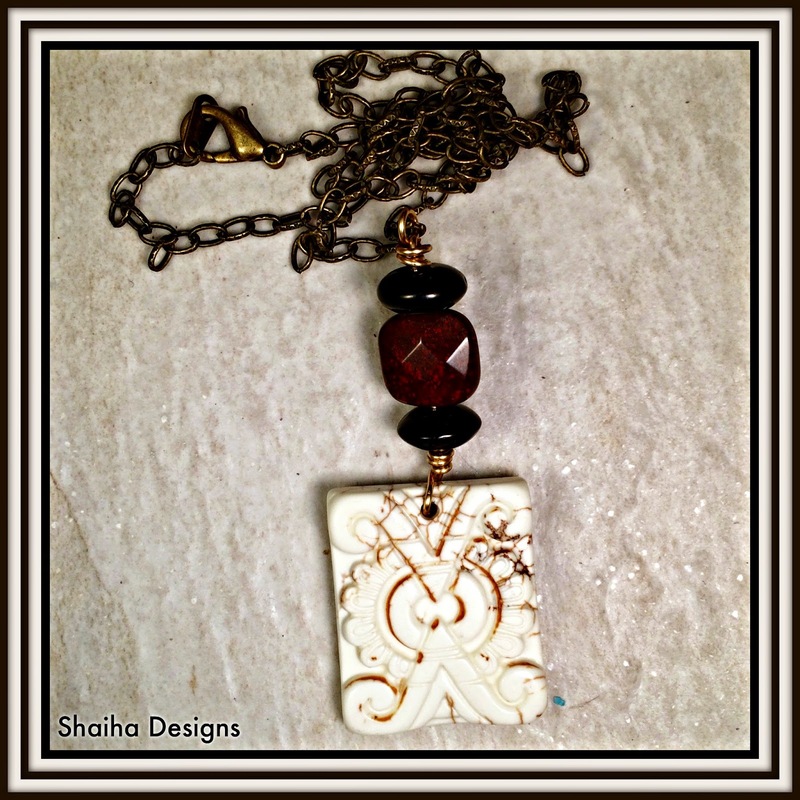 This necklace will be going into Shaiha Designs later this week but you have first shot at it. Just drop me a line. After I finished the necklace, I still had a lot of my kit left and well the jasper was still calling my name. 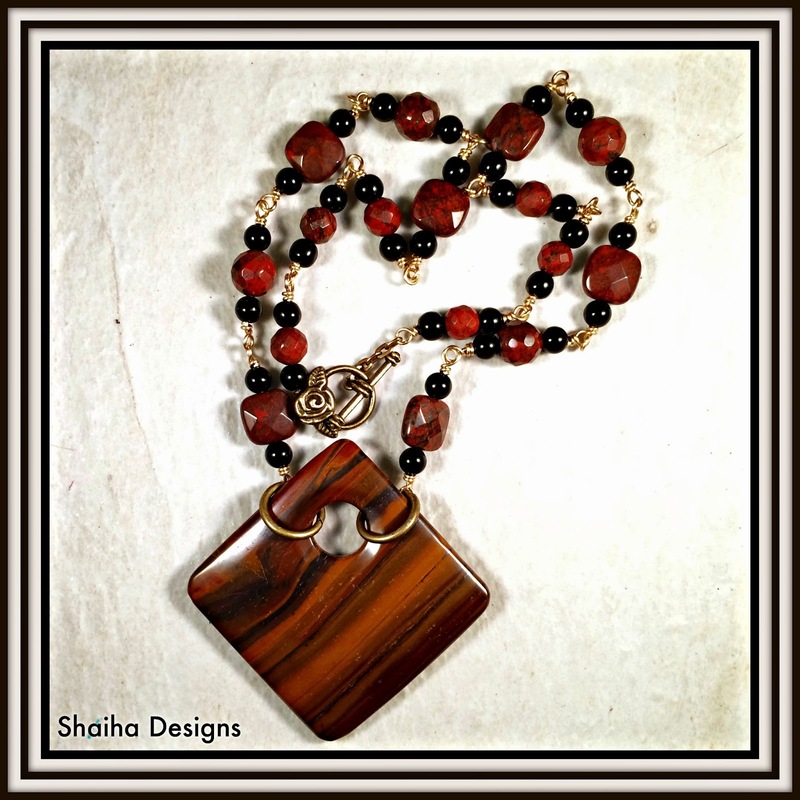 I stayed with the combo of the jasper with onyx but this necklace has a much lighter yet mysterious feel with the addition of the carved magnesite focal. This necklace will also be joining my collection at Shaiha Designs and my wonderful readers have first shot at it. Still lots of jasper left and I hadn't even touched the sea glass. I have always loved the look of waxed linen earrings so I made a pair. Lightweight and fun. These will be donated to Ears to You. 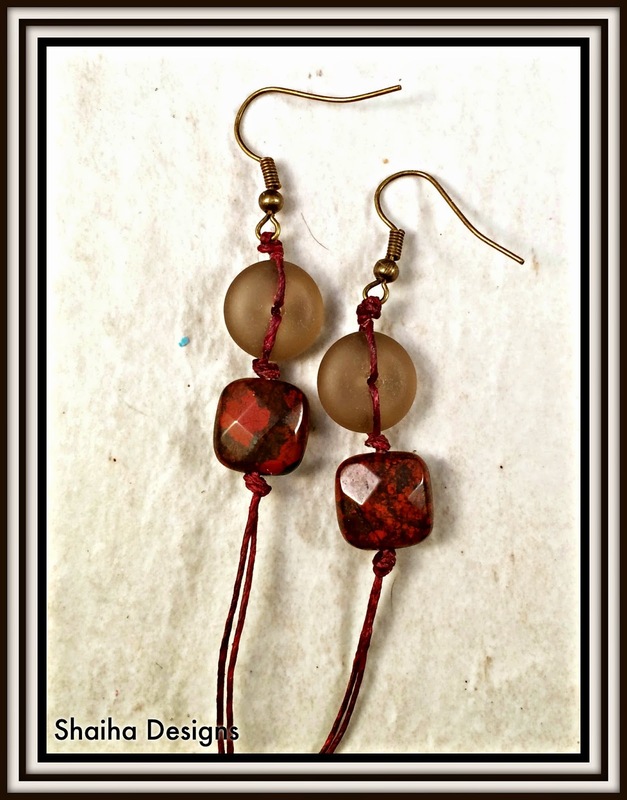 The last pair has a feel of something ancient, something unearthed from a tomb with the vintage carved jade beads combined with the jasper. This pair is also being donated though I think that I will have to whip myself up a pair. Now this is a blog hop so be sure to check what everyone else has made with their jasper. It is such a versatile stone and so many different varieties. I know that I am really looking forward to see what others received and I am hoping that they remembered to take their before pics. I love your necklaces and earrings, especially the last pair! You topped the charts again girl...Always beautiful work. The necklaces are both just fantabulous and the earrings, well lets just say the recipients will be blessed. I love your use of waxed linen. I have never used it because none of my LBS have it so I will have to do some checking and see where I can get some..You have inspired me to try something new. You've been busy and designed great pieces. 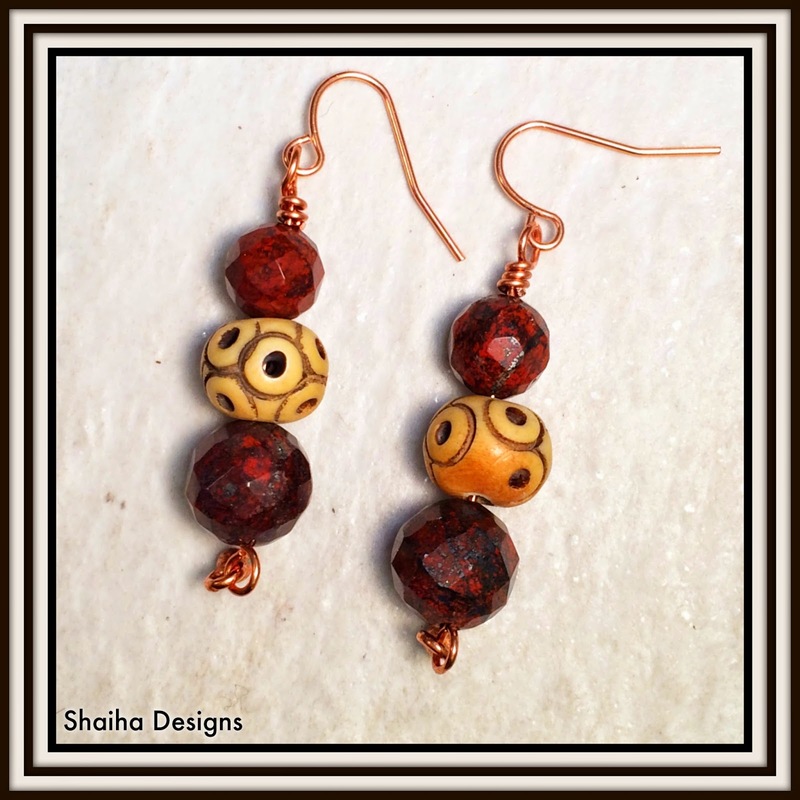 I love the combination of warm colors you used in your pieces and I think my favorites are the first necklace, the pendant and the beads just match so well and the second pair of earrings, I love the look of ancient relics they have. Lovely pieces, especially waxed linen earrings. Beautiful pieces, I am loving the first necklace with the Tiger Iron pendant, gorgeous! If I were you I would make another pair of those earrings for myself they are lovely. I just know who ever receives the earrings are going to be over joyed with their beauty. The waxed linen earrings are so cool! Great job on all the pretty pieces! Thanks for being in the hop, Shaiha. Hi Shaiha! I'm loving both of your necklaces...the boldness of the tiger iron vs the softer/vintage vibe of the magnesite. I'm with Lisa, those waxed linen earrings are beautiful! Beautiful! I love the first necklace...that red just jumps! Great job!